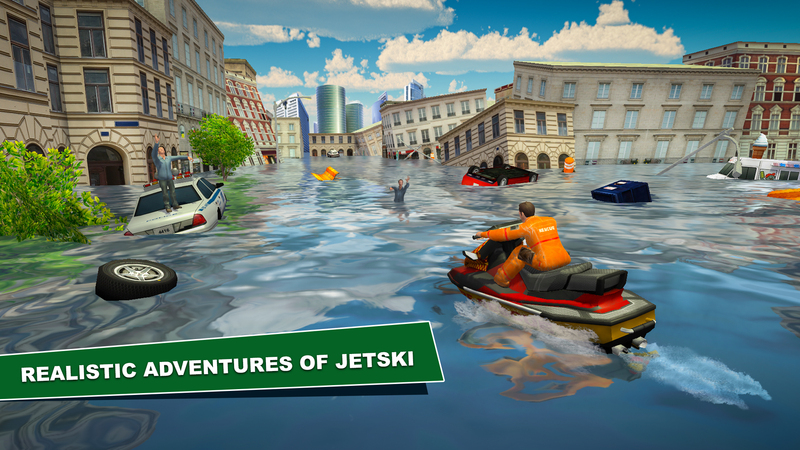 The city is flooded and it’s time for you to get on your jet ski and be a part of rescue lifeguard and save the civilians stuck in the floor. Jet Ski Beach Rescue Lifeguard allows you to Life Ride water bikes, and save lives as Jet Ski Beach Rescuer. You would want to be saved if you were stuck in water without a life jacket. With jet ski rescues you have the chance to save lives of multiple people who are stuck in the beach, and only you can help in their mission of beach rescue. With jet ski simulator, as a life guard you will be able to choose from rescue boats and jet skis and the three characters available, and start your rescue mission. Your life boat speed will not disappoint you, because the Jet Ski Simulator has jet skis with the speed of air, so that there are no obstacles in the way of your mission. However, you will need to be careful about how you are riding the jet ski, because the only obstacle that could stop you from completing your mission of Jet ski rescue is accidents that can affect your health. So, not only you will have limited time for beach rescue, you will need to save your health in that time as well or otherwise you will not be promoted to the next level. Your rescue lifeguard skills will be promoted as soon as you clear one level and move to the second level, and there are total of 10 levels for you to choose from, but you can only choose a different level if you have completed your previous jet ski rescue mission. If you ever wanted to be a life guard and a rescuer than Jet Ski Beach Rescue is the perfect game for you to download, and ride your water bike at the speed of air and complete your dream of beach rescue. – Real-time beach environment with 3D graphics. – Integrated tools for players’ ease.